Apple crumble is one of the first things that my mum taught me to cook, as I imagine her mother must have taught her. 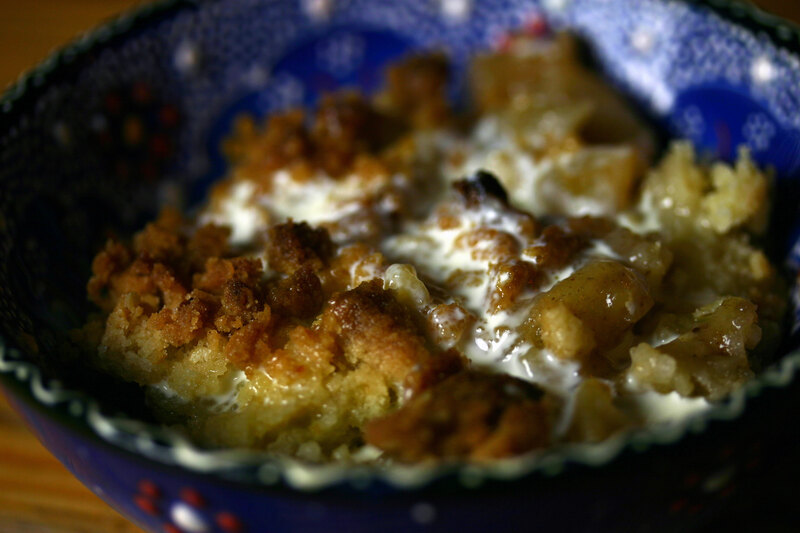 Crumble always on the menu at my grandparent’s house: apple, plum, peach are the ones I remember best. She would serve it with tinned milk, cheaper and more readily available than cream. While Britain excels in the realm of cream – the range on offer in Canada is far more limited even now. I was surprised to learn that crumble originated in World War II Britain, when food rationing meant pies were off the menu. Women made crumbles instead to eke out their supplies of butter and sugar. Which leaves me wondering why my English-born grandmother was such a crumble queen – given that she emigrated to Canada in 1927. I’ve been making apple crumble far too long to follow a recipe. The measurements below are a rough guide – I just go with what looks and feels right. Toss the chopped apples with the flour, sugar and cloves, and turn into a buttered oven-proof dish. The apple mixture should fill the dish three-quarters full. To make the crumble topping, combine the flour, rolled oats, sugar and salt in a mixing bowl. Add the butter and rub it in with your fingers until it resembles coarse breadcrumbs. Scatter the crumble topping and scatter over the fruit, giving it a bit of a squeeze to create some lumps. Make sure the whole surface is covered. Bake for about 30 minutes until the top is crisp and golden, and juice from the fruit is starting to seep to the surface. Serve with cream, custard or vanilla ice cream. So when are you inviting us to try some your cooking??? A fine old classic. My parental instructions relied on brown sugar. Is that less used in Britain?